1 – State research vessels are back on Saginaw Bay and Lake Huron to study fish populations. The Michigan Department of Natural Resources uses four research vessels to conduct annual surveys of Great Lakes fish populations. The vessels went back on the water earlier this month in locations throughout the lakes. The surveys are designed to estimate relative abundance, biomass, age and growth of fish populations, along with their health, diet, survival rates, natural reproduction and movements. On Lake Huron and Saginaw Bay, surveys are being conducted from a Research Vessel called the Chinook. The work involves assessments of lake trout, walleye, and broader populations. The Research Vessel Channel Cat will likely join in for surveys on Saginaw Bay, the DNR says. The Channel Cat also is used for surveys of Lake St. Clair and Lake Erie fish populations, focusing on walleye, yellow perch and lake sturgeon. 2 -Memorial Day signaled the beginning of summer … and the end of the spring kickoff of the Adopt-a-Beach program. The program, organized by the Alliance for the Great Lakes, dispatches volunteers to clean beaches throughout Michigan and other states in the region. Preliminary results from this year’s Adopt-a-Beach kickoff, held April 1 through Memorial Day, show that 68 teams participated in 96 locations on all five of the lakes. The spring teams amounted to more than 1,800 volunteers who removed and catalogued close to 6,000 pounds of debris. A total of 140 health assessment forms also were completed, to help pinpoint pollution sources, according to the Alliance. The cleanups this spring included one earlier this month at the public beach at the Bay City State Recreation Area. Data from previous beach cleanups at the state park in Bay County’s Bangor Township show food- and smoking-related items make up almost 70 percent of litter at the beach. More beach cleanups are planned for the summer. 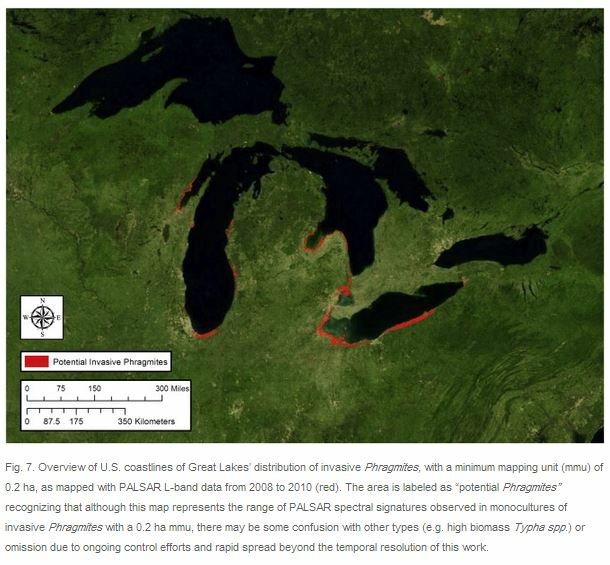 3 -Satellite data has been used to map the invasive plant known as phragmites. The reeds, which already ring parts of Saginaw Bay and can grow to more than 10 feet tall, pose a threat to native coastal wetlands. Since early treatment is a key to controlling the spread of phragmites, scientists from Michigan Technological University and other partners spent three years mapping the U.S. coastline of all five Great Lakes, using satellite data and field studies. The map shows the locations of large stands of phragmites located within six miles of the water’s edge. The greatest amount of phragmites were found in Lakes Huron and Erie. The study results were published in a special issue of the Journal of Great Lakes Research.